Lightweight, 4-sided, multi-lingual caution sign. 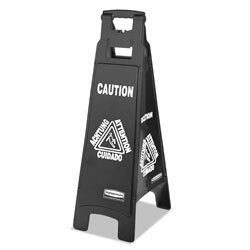 Lightweight and versatile caution sign is easy to place wherever you need it. Foldable for easy storage. Integrated carry handles. Four-sided for standing stability. Warning messages in English, French, Spanish, and German provide effective communication to a broad audience. Frame Color: Black; Size: 11-9/10w x 38h; Message(s): Caution; Material(s): Plastic. Includes one sign. 11 9/10 x 38 Safety Cones from Rubbermaid! 942 In Stock today.